What better way to start a new month than a finish? I was able to get one of my Upcycled Blues tops (#18) all finished. This is one I called Positively Scrappy. I really liked it, and was eager to get it finished. The biggest reason I wanted to get it done was because I didn't like how the off white didn't seem to want to press well. 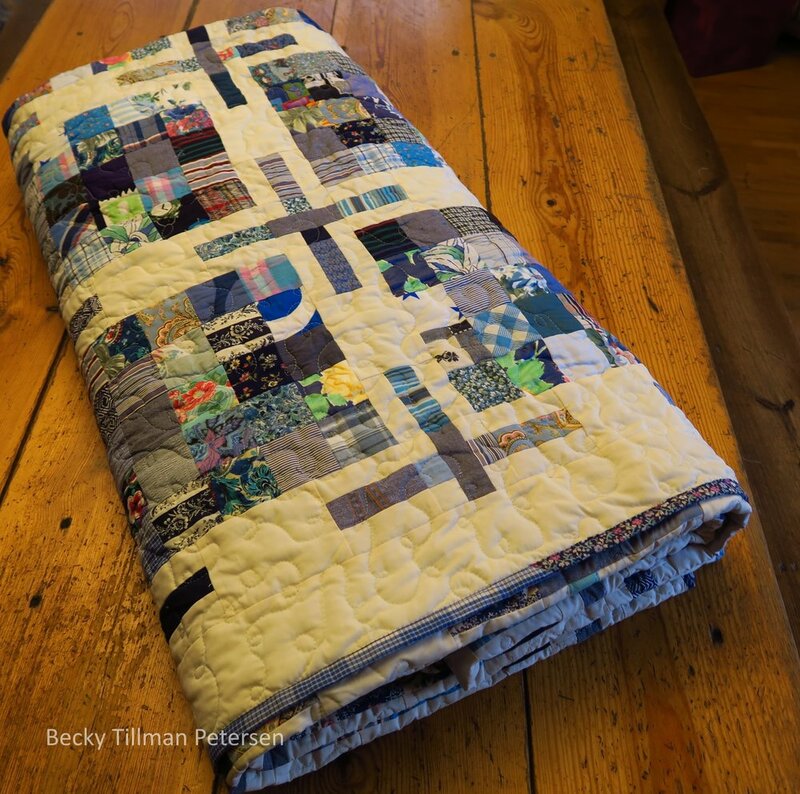 I wanted to just quilt it and be done with it - I knew once I quilted and washed it, all those issues would just "go away". The pattern said it finished at 100"x100", but mine always shrink after washing. I think it is more like 96"x 96" now. It is a general "leftovers" quilt - using 2.5" squares - so perfect for extra pieces or even misc. 2.5" strips you might have lying around. Of course, a nice scrappy quilt doesn't have to be only one main color - I was just using up my recycled blues - thus all the blues. If you look carefully, of course, you will see reds, purples, etc. as the requirement here was that blue played a major role in the color of the fabric and not necessarily that it was the only color in it. The name is derived as a play on the "plus" signs formed by the 9 patches and pieced sashing strips. And who among us doesn't like a quilt roll? I can't wait to finish up this whole series and then make quilt rolls of them all! :) Guess I had best get busy, huh? This is number 18 from the upcycled blues. I had no idea when I got started that I would be making this many upcycled blues tops. And just in case you are wondering about the backs of these. All these upcycled quilts will have upcycled backs. They will all be pieced, as I can't see myself having a big enough piece of fabric that doesn't need to be pieced. This one was made from some dolphin fabric, some green checked and there is a small-ish piece of clam shells fabric at the top of the dolphins to make it large enough. I got all three locally at the second-hand shops. This one seemed to wrinkle up quite a bit at washing. It's a good thing I like the look! My loop de loop quilting just kind of all scrunched up and you can hardly see it. I did use light blue thread for the quilting and quilting isn't really "my thing", so you can just pretend you see it, okay? I did update the pattern with the finished quilt picture instead of just the quilt top. It's here. Don't forget that you've got a chance to get some really good deals over at the store. Honestly. My sis has half yard PACKS for cheaper than you'll pay for a 2.5" strips roll elsewhere and you'll get a whole lot more fabric in them! You should check them out. If you love it, get it, because there is no guarantee she'll have anymore.